On April 11 the State Bank of Việt Nam decided to increase the rate of the US dollar it buys from credit institutions by VNĐ100 to VNĐ22,675. The selling price was pushed to the prescribed ceiling. The dollar’s value against the đồng, which had been steady for a while, has been on an upward trend recently. A report by the National Financial Supervision Committee says the exchange rate showed signs of decreasing in January, but has increased steadily since mid-February and nearly reached the ceiling rate fixed by the State Bank of Việt Nam. This upward trend has continued in April and the central bank had to raise its central rate by VNĐ5 to VNĐ22,316 to the dollar, up VNĐ175 or 0.7 per cent from late last year. Following this, banks fixed their dollar selling price at VNĐ22,710-22,720. One of the prominent economic happenings globally in recent times has been the appreciation of the greenback, which has affected most countries including Việt Nam. The dollar has risen steadily as the US Federal Reserve has been continuously hiking the interest rate. On March 15 the FED raised the rate by 25 basis points to 1 per cent, the second hike in three months, and expects to effect two more hikes this year and three next year. In the face of the appreciation of the dollar, many countries will continue to devalue their currencies to support their exports. Since Việt Nam’s public debts have been growing at a rate three times faster than its economic growth the Government has made herculean efforts not to devalue the đồng. But this has been threatening to make the country’s exports uncompetitive, and so finally the Government has begun to act, tweaking the đồng’s value a few days ago. Analysts said the exchange rate is affected not only by the dollar’s appreciation but also by other factors, domestic and global. 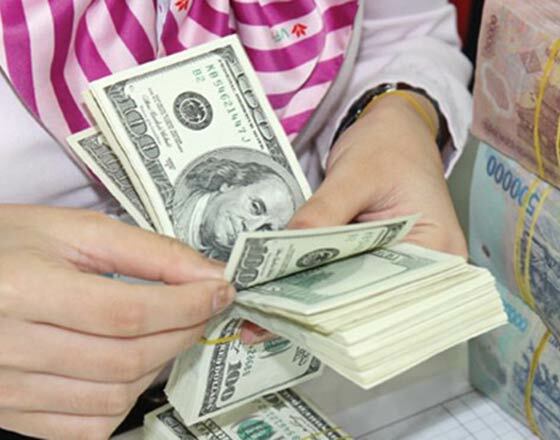 The flow of foreign exchange into Việt Nam this year is expected to be modest because from July this year the country will no longer get preferential loans in the form of official development assistance (ODA) since it has become a middle-income country. Instead, the country would get preferential loans and, gradually, market-based financing. A Central Economic Committee official said the low interest rate in the Vietnamese inter-bank market also contributed to putting pressure on the exchange rate. The rate sometimes dropped to under 1 per cent. These moves encouraged credit institutions to hoard the greenback, thus creating a shortage in the market, putting pressure on the exchange rate. The rising inflation in recent months brought back fears about the robustness of the đồng, bringing more pressure on the exchange rate. In the first two months of the year prices rose by 4.96 per cent year-on-year. Rising imports combined with sluggish export growth sent the country’s trade deficit soaring in the first three months of the year to US$1.9 billion, or 4.4 per cent of exports. The larger trade deficit also had an impact on the exchange rate, experts said. Banks continue to find it very difficult to recover their money from defaulting borrowers though mounting bad loans put pressure on their capital base and threaten their ability to grow in a highly competitive environment. Many bankers in HCM City made this complaint at a recent meeting held by the State Bank of Việt Nam (SBV) and the city People’s Committee. According to the SBV, in late February the bad debt ratio of HCM City-based banks was 3.67 per cent, which was badly affecting their business. The bankers said their banks were facing difficulties in recovering bad debts. They said mortgaged properties were not easy for lenders to sell to recover debts because legal procedures were very complicated and the property market was sluggish. To sell a mortgaged property banks need to go through many time-consuming steps, including verification of the property, enforcement of judicial sale of property and property valuation. Some of the bankers say under current legal provisions, creditors like them do not have any rights that can enable them to recover their money. The courts do not accept any bad debt-related petition from credit institutions if they do not have the exact residential or working address of the borrower. Besides, the lenders have to pay enforcement costs, while the debtors do not have to pay anything, meaning they often intentionally delay the enforcement. This in turn pushes the banks’ costs up, creating a vicious cycle. Economists say it is very difficult for credit institutions or the Việt Nam Asset Management Company (VAMC) to sell bad debts since the country lacks a real debt trading market. In the face of this situation, many banks have to settle bad debts on their own and resort to buying back debts they had sold to the VAMC. Việt Nam International Bank for instance paid VNĐ1.336 trillion to buy back its bad debts, bringing down its bad debt amount with the VAMC by 30 per cent. Earlier Vietcombank bought back the entire amount of bad debts it had sold, worth VNĐ4.3 trillion, and wrote them off at VAMC. Many other lenders have done the same, including Sài Gòn Commercial Bank, which reduced its bad debts at the VAMC from VNĐ17 trillion to VNĐ14 trillion last year. Ocean Commercial Bank plans to buy back all its bad debts from the VAMC by the end of this year. The bankers at the meeting sought the People’s Committee’s help to eliminate the legal barriers to the disposal of mortgaged properties and enforcement of verdicts to create favorable conditions for recovering bad debts. They also called on the central bank to create a legal framework for allowing them to convert the bad debts into equity in their debtors’ businesses. An SBV spokesperson said the central bank had petitioned the Government to amend the laws on bad debts.